Well, it may not be the healthiest choice on the breakfast menu, but it sure is pretty! Mermaid Toast is the latest trend to catch steam online. What’s in it? Cream cheese (dyed), sprinkles, gold leaf flakes and sliced bread . It all started with “Unicorn Toast” and now its recently evolved counterpart “Mermaid Toast” is the latest and greatest toast to try if you dare. The Unicorn Toast trend has been attributed to Miami-based food stylist and photographer Adeline Waugh also known as @vibrantandpure on Instagram. Waugh said she originally called her creation “Watercolour Toast” but her Instagram friends quickly dubbed it “Unicorn Toast” instead. The food trend has been replicated in countless photos uploaded to the social media site. Earlier this month, Waugh showcased her latest invention – Mermaid Toast. 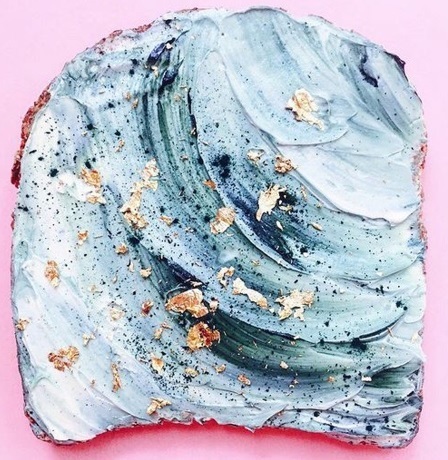 Similar to the unicorn toast, mermaid toast involves a variety of blue green algae powders and liquids mixed with almond milk cream cheese to create an ocean-like palette. Gold leaf flakes can be sprinkled on as well for added effect. BOTTOM LINE: A magical start to every morning awaits you with Mermaid Toast!